We were so pleased when we discovered earlier this year that Seeland were introducing tweed to their collection of shooting wear. The Ragley has been designed for game shooting, so provides classic garments upholding traditional British country life. Besides fulfilling that traditional element, the Seeland Ragley has been developed to be both durable and functional. The tweed is Scotchgard™ DWR treated, meaning that it’s dirt and water repellent. It doesn’t absorb water when there’s a good old British downpour, so you don’t end up wearing a heavy sodden jacket. The Ragley Jacket also has benefits from the new, improved SEETEX® membrane making it both waterproof and windproof. With large cartridge pockets, hand warmer pockets and faux suede detailing the Seeland Ragley Jacket is perfect for both formal and informal shoots. With matching waistcoat, breeks and flat cap the Ragley tweed is just right for the modern game shooter. The colours are taken from the British landscape, blending in but still offering a classic checked look. In fact, it’s a very smart tweed! Seeland has catered for the whole family with the Ragley tweed. Ladies have the choice of either a jacket, offering the same functionality as the men’s, or a very smart and well-cut blazer. There are, of course, matching breeks which are again perfectly cut for the shooting lady. 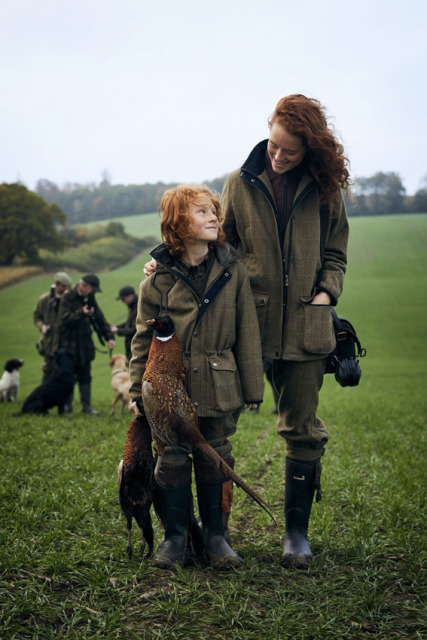 Children haven’t been forgotten and the Ragley Kids Jacket and Breeks means that the whole family can be kitted out for shoot days.